I'm going to run a full review when SUPERGRID hits theaters in December but since the film is opening the Blood in the Snow Film Festival and since it appears tickets are still available, I just wanted to say BUY TICKETS AND GO. SUPERGRID is a post-apocalyptic action film about two brothers who have to make a run along the highway known as the Supergrid. 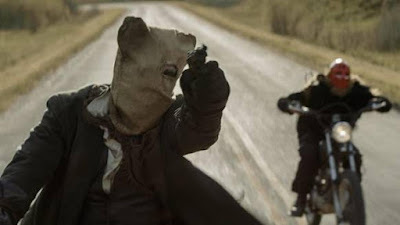 A lawless stretch of road bandits kill and rob anyone they meet while the pollution created by a giant mining operation is slowly killing everyone. Its a grand low budget action film with great characters and action. Its the sort of film you curl up with some friends, popcorn and a beverage of choice. Trust me you want to see this, and with tickets still available for the BITS screening you can get on the bandwagon sooner.